Light House is a non-profit arts organization in Charlottesville teaching young people how to tell a story though the media of film. In 2015, the organization was able to purchase Vinegar Hill Theater, an iconic community movie theater for its expanding programs and new offices. Wolf Ackerman worked closely with its founder, director, and board to develop plans for the interior renovation of the original theater and an adjacent restaurant space in Phase I that was completed in June 2016. 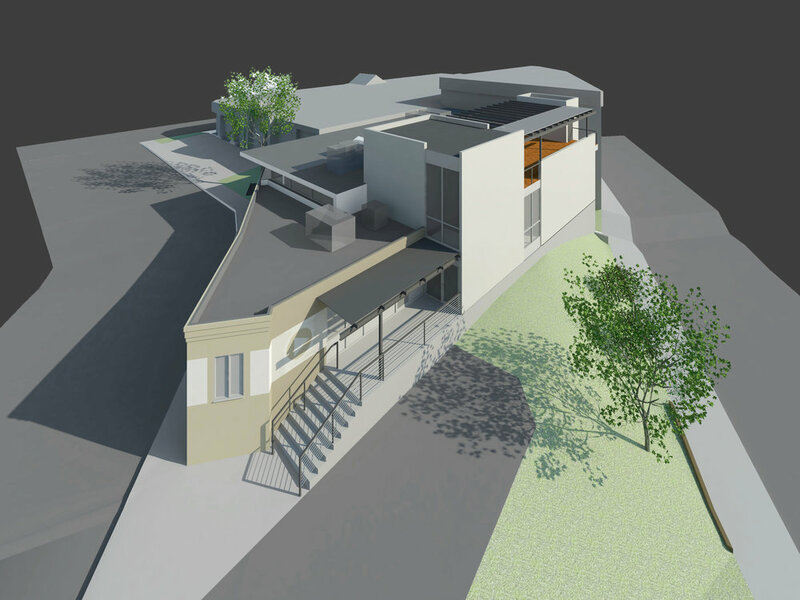 As part of our work, we have also developed the design for a 3 story addition that will be completed as part of Phase II. The old theater has been given new life as a screening room and teaching space that doubles as a community venue for film festivals and lectures. The ticket window was and the concession were kept in place but give a fresh make-over. Adjacent space (previously a restaurant) has been turned into offices, meeting areas and will eventually be home to a library. The new, 3-story addition will provide two major studio workshops for classroom training and editing as well as a large, outdoor roof terrace for nighttime screenings and organizational events.